.200" upshear allows for part cutting from thin materials, 1/4" dado cuts & outside edge profile cutting. 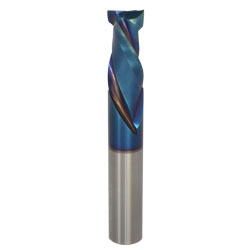 LMT Onsrud has long been an innovator in compression spiral tooling, and the all-new Polaris line of tools is the next evolution in technology and innovation. Designed with maximum tool life in mind, the Polaris features an advanced coating to protect each cutting edge of the tool. This coating reduces wear and reduces heat build-up. All of this results in less downtime, fewer tool changes, fewer re-runs, fewer defects and decreased tooling costs.